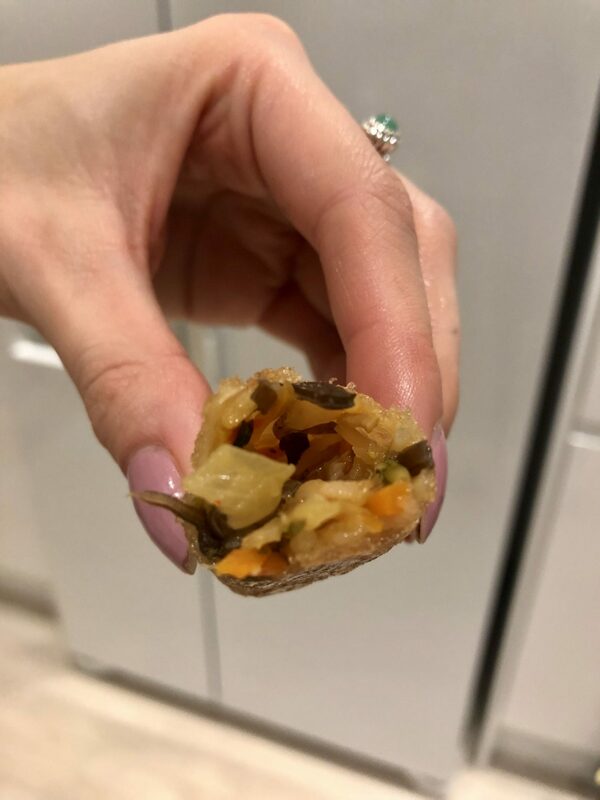 I have decided to start a new series of blogs as I discover new (to me at least) gluten free foods. Since being diagnosed with coeliac disease it has been my mission to hunt gluten free alternatives to the foods I loved. This is not going to be a post with glossy photos, but quick snap shots to give you an idea of what the food really looks like before I devour it. And I don’t want my food to get cold so it’s food>photo. Since going gluten free, I have been CRAVING a Chinese takeaway, but unfortunately they are full of gluten. Thin rice paper alternatives are often lacking in the indulgent greasiness which makes them equally naughty and delicious. 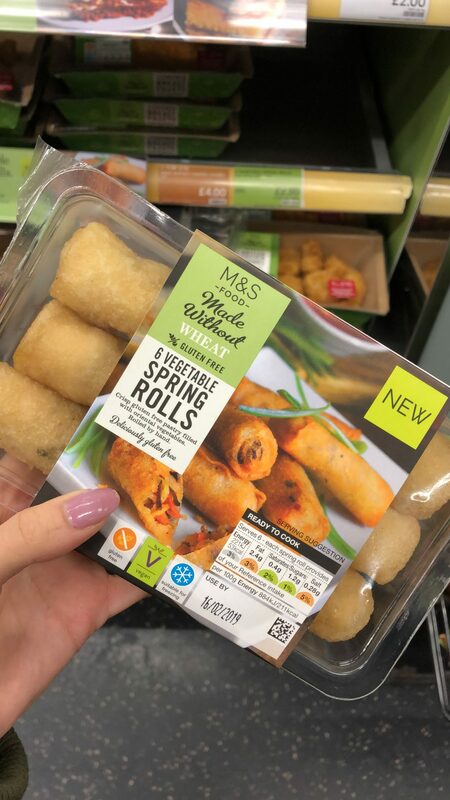 But M&S have just brought out gluten free vegetable spring rolls which are also vegan so anyone who is dairy free can enjoy them as well. Spring rolls for all! 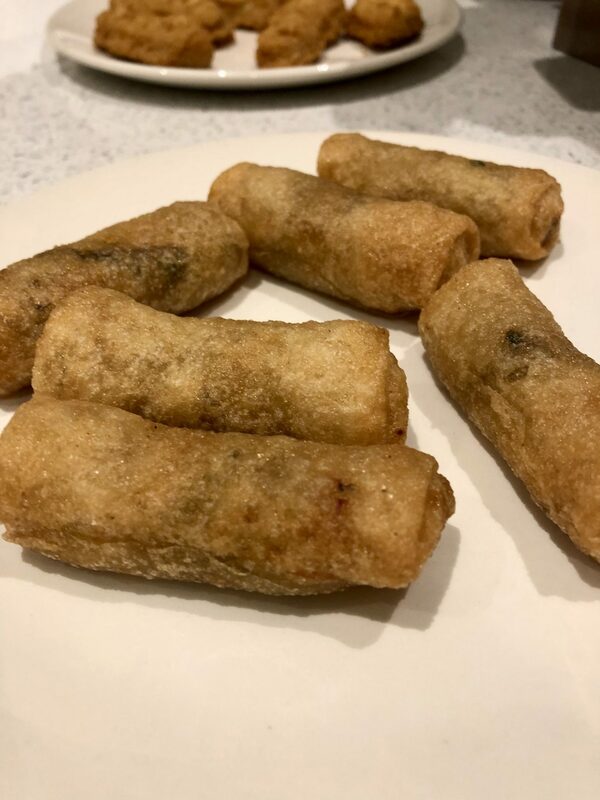 This probably sounds a bit keen for the first thing I’m reviewing, but I can honestly say that these are super crunchy, a little bit greasy (giving me that Saturday night Chinese takeaway vibe) and are full of flavour. My gluten eating friend and I concluded that we actually preferred these to regular spring rolls. They had all the best bits of a spring roll without being as heavy. The gf spring roll is something of a contender in the mainstream food world. You get six in a packet, although they aren’t as big as some of the gluten containing ones in M&S. However, at £2.50, I think that is more of a tempting purchase than the regular larger ones for £4. And I like bitesize treats. It helps me to justify eating double the amount. Party food, Chinese fakeaway night, Tuesday night snack… I’m sold. 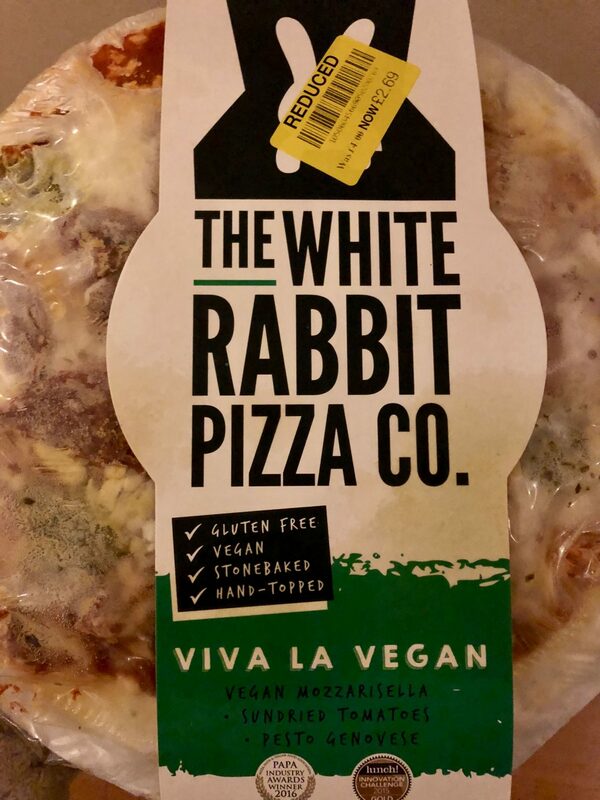 It is hard to get a gluten free pizza right, but White Rabbit Pizza Company have a range of stonebaked, hand-topped gluten free pizzas, some of which are also vegan which are definitely up there. They even have the name of the person who made your pizza on the cardboard base giving it a personal touch (a bit like a Lush product for any Lushies out there). I am yet to try their Hammer Time (ham and mushroom) and Chorizo Loco (chorizo and red onion) pizzas which both sound heavenly as they don’t seem to be sold in my local Waitrose, but I was surprised to find that one of my fav gf pizzas to date, is vegan. 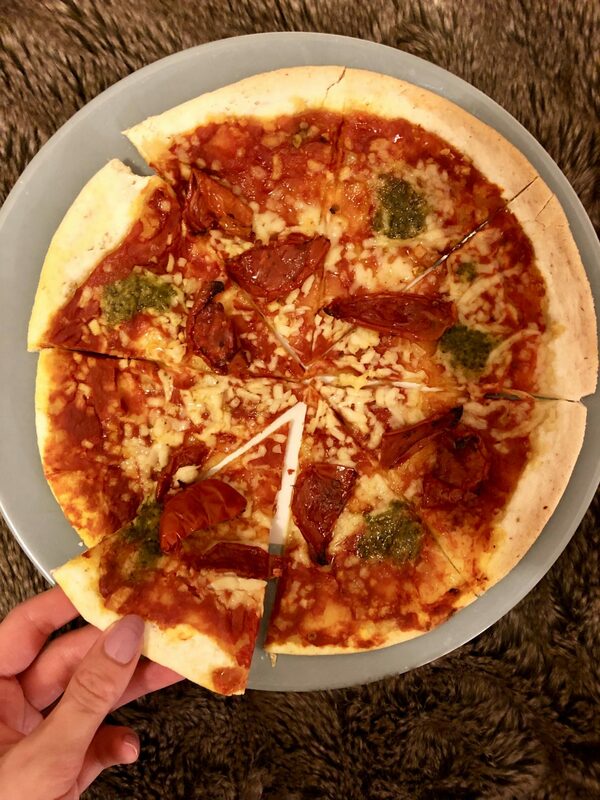 Now I’m a girl who loves cheese, but I don’t feel as though I miss out at all thanks to Viva La Vegan’s vegan cheese alternative which is accompanied by sun-dried tomatoes and pesto which pack this pizza with flavour. It is simple but so tasty and my only complaint is that the pizza isn’t big enough (because who doesn’t want more pizza?!). Top tip: Before cooking, cover it in a load of extra virgin olive oil and leave it in the oven a little longer than the recommended time for a slightly crispier base (I’m not a fan of soggy bottomed gf pizza). £5 which is a little pricey (although not unusual for a gf pizza), but Waitrose currently sell them for £4. Also always check the reduced counter as they often end up there for a couple of pounds. I think I have bought this pizza around 4 times now. If I fancy a pizza night in, I would probably opt for this one over an even more expensive takeaway, knowing that I’m safe from being glutened. 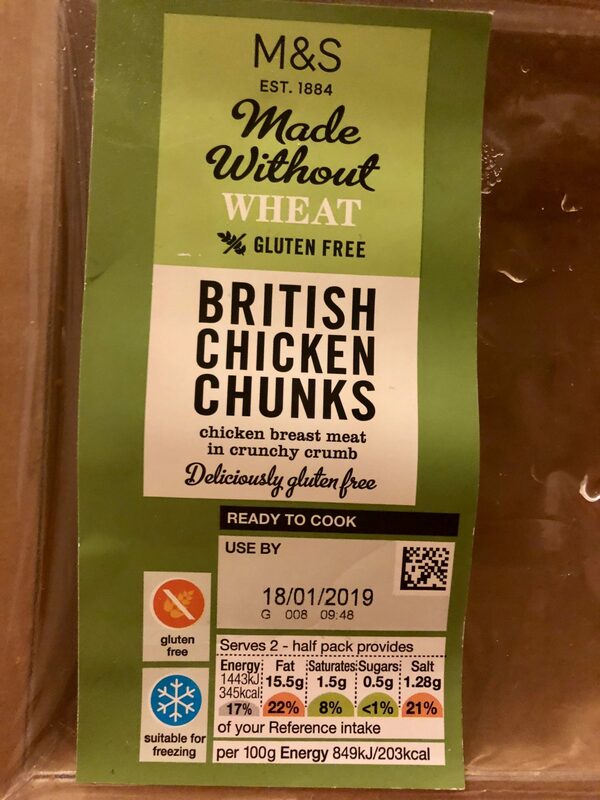 We’ve waved goodbye to Mcdonalds chicken nuggets and welcomed Leon’s GFC alternative, but M&S have provided us with an option to enjoy at home with a pack of their Made Without Wheat Chicken Chunks. 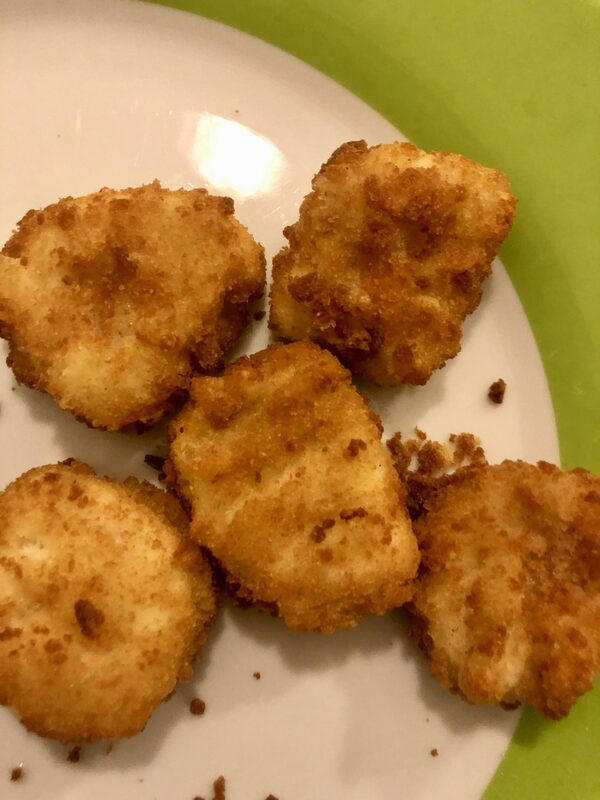 I’m a sucker for breaded chicken and these little bites do the trick. They aren’t over breaded, so you still get a decent amount of chicken in each piece. The breadcrumbs stay relatively intact once they’re cooked and crisp up nicely ready to dip into a sauce of your choice (garlic mayo and Heinz ketchup all the way for me). Probably not the best gf breadcrumb coating I’ve tried, but I would equally never turn down these chunks of tastiness. I picked these up reduced for £1.20 which was excellent value for money, (are you even gluten free if you don’t spend half your life in the reduced aisle?) but their regular price of £4 is a little steep, but not unusual for M&S. The only redeeming point to this price is that you do get a lot for your money. In the nutritional information it recommends that it serves 2, but this could easily be 3 portions or possibly more. They are also in a 3 for £10 offer which includes other products, so this can be worth it if there are other things you want to buy. Probably not on a regular basis due to the price, (unless I managed to nab them for below £2 again) but they are tempting to get to stick in the freezer, even just to have as a (drunk/hangover) snack. 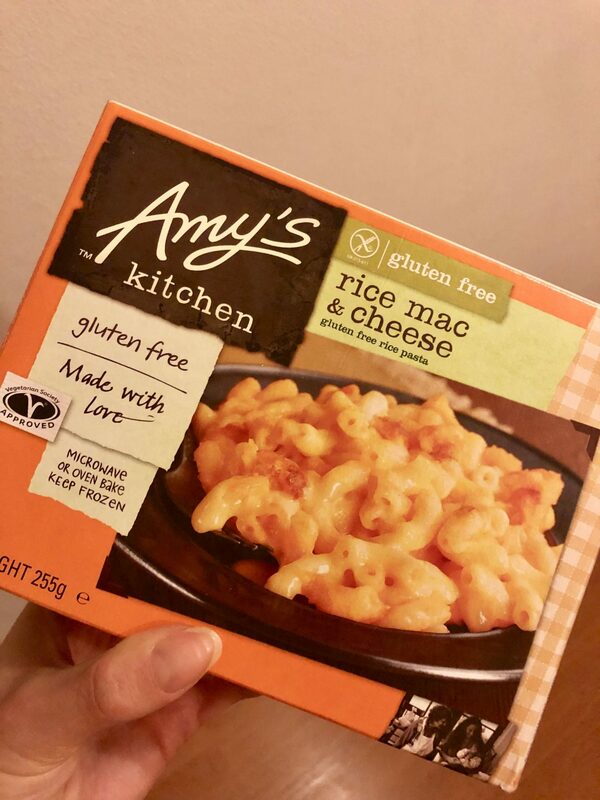 Amy’s Kitchen has a range of different vegetarian, vegan and gluten free ready meals made without any nasty additives but with lots of delicious organic ingredients. Having previously tried their burrito, I bought the mac and cheese from the freezer section in a tiny supermarket where there were hardly any other gf ready meals available. The combination of my two fav foods sounds like a winner, but when I have previously tried ready meal mac and cheese (even pre-coeliac), I have found them to be sloppy/gloopy and the pasta overcooked. But Amy’s Kitchen has been a bit of a game changer. The pasta is al dente, the cheese sauce to pasta ratio is spot on, and it tastes of good old, home cooked mac and cheese. The ingredients revealed to me why I liked it so much, as it was only made using the stuff I would at home. I also saw on their website they have a gluten and dairy free option for anyone looking for both. Gluten free usually means selling all your personal possessions in exchange for food. But this ready meal only costs around the £2.40/£2.50 making it an affordable quick option. It is currently on promotion in Waitrose for just £1.80, so grab it now to give it a go. I have bought this twice now when I have stayed at other people’s houses and don’t feel safe cooking my own food due to cross contamination. Or you know, cba and want a quick mac and cheese. Available in the freezer section in selected Waitrose, Sainsbury’s, Asda, Tesco, Morrisons and Co-op. Let me know which products you think I should try/would like me to review next. Happy gluten free eating.